Halfway through the 2015 drama Creed there is a scene of a boxing match. The two boxers tap gloves, the bell rings, and they begin to warily circle one another. They start to get in some hits, back and forth. Blood is drawn. Tempers rise. The bell rings, and the boxers go back to their corners to recover and listen to their trainers. They head back out again, punching each other with a fierce brutality. Somewhere into this scene it will become apparent to the viewer that the camera angle has not changed. The camera moves fluidly around the ring, from mid-shot to close-up, highlighting the fight, the characters’ reactions, the audience and so on, but it is all in a single take. These fighters are getting beaten-up and bruised. There is blood on their faces. That one complex tracking shot just keeps going and going. The impressive part of the scene is not the technical achievement, although it is worth noting that it was achieved in a single take without editing tricks and with a roving make-up crew diving into the ring and applying the blood to each fighter when the camera was pointed in another direction. The impressive part is just how immersive and emotionally effective these sorts of camera techniques make the fight. It is arguable that there has not been a better realisation of a boxing match in a film before. That would include Martin Scorsese’s legendary Raging Bull and any of Avildsen and Stallone’s six Rocky films. That second comparison is the key one, because of course Creed is a sequel to those Rocky films. Released back in 2015, it is a pitch-perfect continuation of one of Hollywood’s best movie franchises: not a cash-in to further profit from Rocky’s reputation, but an artistically valid and deeply personal film from one of American cinema’s most talented new filmmakers. ‘I learned in film school,’ said director Ryan Coogler, ‘that the type of movies I like to make are the ones that are extremely personal to me.’ Coogler said this in an interview with film industry website Deadline, while explaining why – after making a huge impact on critics with his debut feature Fruitvale Station – he would select as his second project the seventh film in the decades-long Rocky saga. While Coogler was preparing to shoot Fruitvale Station, he father fell ill. An undiagnosed neuro-muscular condition affected his ability to walk, and his prognosis was approaching a stage where his doctors were suggesting that it might be terminal. While Coogler’s father ultimately recovered – it turned out to be a severe vitamin B12 deficiency – the experience of seeing his strong, powerful father having to fight his condition left an understandable impact on the director. The experience drove him to apply a similar struggle to his and his father’s screen hero Rocky Balboa. 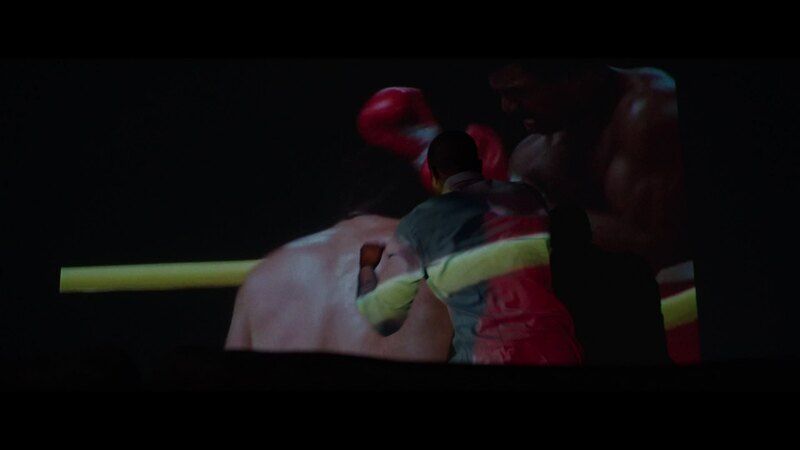 The idea of putting Rocky through a health crisis – Coogler and his co-writer Aaron Covington settled on non-Hodgkin’s lymphoma – was combined with a second idea: revisiting Rocky’s first and most effective opponent, Apollo Creed (played in the first four Rocky films by Carl Weathers). Creed had died in the ring midway through Rocky IV, but the idea developed to give him an illegitimate son. It would mean that, at the time of making the new sequel that son would be about 30 years old. By having that son, whom they named Adonis, want to become a professional boxer, they could echo the original Rocky with Adonis (or Donnie, as he is usually called) as the new Rocky and Rocky advancing to the role previously taken by Mickey (Burgess Meredith). The story is beautifully crafted to both echo Rocky and step out from its shadow. Donnie is a very different boxer to Rocky. He comes from a combination of a rough childhood and a privileged adulthood. The very thing that could make his life easier – his Creed legacy – is the very thing he doesn’t want to rely upon. Nonetheless he finds himself in a similar situation to Rocky in the original film: an unexpected chance to fight a world champion, and to prove himself. This very strong symmetry with Rocky makes Creed a very familiar, comfortable sort of a film. It is similar enough to feel like a continuation of the same story. At the same time, it is distinctive enough to feel like its own movie too. Creed was the perfect title for the project: reflecting the one-name title of Rocky but also redirecting the franchise to a new character. It may be Rocky Balboa’s seventh film, but it is firmly and overwhelmingly Adonis Creed’s story. Coogler finished developing the story for Creed with Aaron Covington. He then met with Stallone in 2013, before Fruitvale Station had even been released. The meeting was arranged by Stallone’s agent Adam Venit, who had already heard Coogler’s pitch and thought it had a lot of potential. So convinced that Stallone would reject him outright – a young filmmaker without a released feature asking to use characters that Stallone himself had created – Coogler stopped off on the way to Stallone’s house to buy a Blu-ray disc of Rocky II. He figured that if nothing else, the meeting could get him a signed copy of the movie to give to his father. With Stallone onboard and giving the script his blessing, MGM greenlit the film on a US$35 million budget. They formally announced Creed to the press on 24 July 2013. Coogler had an actor set to play Adonis “Donnie” Creed before he even went to meet with Stallone: his Fruitvale Station star Michael B. Jordan. The then-27-year-old Jordan had originally worked as a model before segueing into acting; his early roles were in guest shots on TV shows including Cosby, Without a Trace and The Sopranos. His first significant film role was in the 2001 baseball drama Hardball. A key role in the TV crime drama The Wire followed. In 2012 he starred in the films Red Tails and Chronicle. The following year he teamed with Ryan Coogler to shoot the acclaimed independent drama Fruitvale Station. In the meantime, Sylvester Stallone was concerned that his skill set as an actor had atrophied in recent years. To ensure his performance would be as strong as possible, he hired an acting coach – Ivana Chubbuck – to re-develop his skills and re-connect with the Rocky character. It was Chubbuck who instructed Stallone to stop simply mourning his son’s death, but to actively dig into his grief and apply it to his performance in Creed. Prior to becoming an actor, Thompson had performed for two years as the lead singer of a band named Caught a Ghost. The day after she was cast in Creed she started collaborating with the film’s composer Ludwig Göransson on a series of electronic tracks for Bianca to potentially perform during the film. Eight tracks were produced in total, all with Thompson’s vocals, but not all were included in the final cut of the film. Tessa Thompson delivers a very strong and naturalistic performance as Bianca. She has a particularly grounded and realistic quality, and that helps develop an equally ground and realistic romance between Bianca and Donnie. In that respect it bears a lot of similarities with Rocky and Adrian’s developing romance in the original Rocky, but they are also clearly very different people. They come from different places. Bianca’s developing deafness adds colour to her character and provides one of the single-most effective moments in the film – blocking Donnie’s apologetic pleas out by pulling out her hearing aids – but it does not ultimately form any significant aspect of the plot. It sits as a very obvious hook for potential sequels; the first is due by the end of 2018. Principal photography commenced on 19 January 2015. The first scene shot was from the climax of the film. The production took advantage of a football game at Goodison Park in Liverpool, England, to shoot Donnie and his climactic opponent “Pretty” Ricky Conlon (Tony Bellew) entering the stadium for their title bout. The real-life football crowd stood in for the fictional boxing crowd during half-time, with Stallone appearing before the audience to whip up their enthusiasm and get them cheering for the two stars. While the production started at the climax, the film’s story begins in 1998 with the introduction of Adonis “Donnie” Johnson, an orphaned boy living in a Los Angeles youth detention centre. He is angry and rebellious from the outset. He is visited by Mary Anne Creed, the widow of his biological father Apollo Creed, and Mary Anne offers to take him out of detention and into her home. In Rocky II and Rocky IV, Mary Anne Creed was played by Sylvia Meals. Meals, sadly, had died in 2011, necessitating a recast. The role was filled by Phylicia Rashad, an actor best known for her long-running portrayal of Clair Huxtable in the popular 1980s sitcom The Cosby Show. Seventeen years later, Donnie – using the surname Johnson – works at a securities firm by day and drives across the border to Mexico to be an unlicensed boxer by night. The rage that powered him as a child clearly remains: he is desperate to become a professional boxer – something Mary Anne, whose husband died in the ring, will not accept. Alone in his room, Donnie pulls up a YouTube clip of his father’s first fight against Rocky Balboa. It’s clear he has watched it countless times. When he rises and starts to shadow box in Rocky’s place against his father, it’s clear he had done this many times as well. It is one of the key moments of the film: a son in the shadow of an absent father, missing him terribly and yet deeply resenting him at the same time. Creed’s score was composed by Ludwig Göransson who, like Michael B. Jordan, had studied film alongside Coogler at USC. Göransson’s score uses Bill Conti’s original Rocky themes very sparingly, and this scene is one of the few moments that one of the themes appears. It makes a powerful impact, emphasising the scene’s nature as one of legacies and shadows. When Donnie admits his aspirations to become a boxer, Mary Anne fiercely opposites it. When he goes to the Los Angeles Delphi Boxing Academy to train, he is blocked by family friend Tony “Little Duke” Burton, the son of Apollo Creed’s original trainer Tony “Duke” Evers. A resentful Donnie leaps into the ring and offers his car to anyone capable of beating him. One boxer takes up the offer and lays him out within moments. Ashamed and without a car, Donnie packs up and flies to Philadelphia. The boxer who defeats Donnie was played by Andre Ward, a real-life light heavyweight boxer. Donnie has three key fights throughout the film, and in each fight his opponent was played by a genuine professional boxer. At the time he shot Creed, Ward was the WBA super middleweight champion. Upon arrival in Philadelphia, Donnie heads straight for Adrian’s. It is a local restaurant owned and managed by Rocky Balboa; his father’s former opponent and close friend. After introducing himself, he asks Rocky to train him. Rocky refuses: he is out of boxing for good, and has no interest in returning. It is remarkable that, given the enormous profile of Rocky Balboa in American pop culture, Ryan Coogler simply has him walk on screen. There is no hero shot, and no fanfare. Simply put: one minute Donnie is alone in Adrian’s Restaurant and the next Rocky is standing next to him admiring a photograph on the wall. Stallone slips back into Rocky with what feels like effortless ease. Viewers had been following Rocky’s life for 39 years by this point, which must make it one of the most sustained portrayals of a movie character ever. It has always been Stallone’s best role, and he has always brought the best of his talents to it. That is no surprise: in many respects Stallone is Rocky. He wrote the original screenplay because nobody would give him a break as an actor. He filled that screenplay with his own frustrations and resentment and refused to sell it without a guarantee he could play the part himself. Creed is notable in that for the first time in the Rocky saga Stallone is acting out someone else’s screenplay. It is a masterful performance. Perhaps because he was not writing and directing this time, or perhaps it was the benefit of Ivana Chubbuck’s coaching, but there are emotional depths that Stallone dives into that are simply remarkable. He honestly gives a better performance in one facial expression than some actors manage in their entire careers. In one particular expression he effectively guaranteed himself a Best Supporting Actor nomination at the 2016 Academy Awards. That nomination came but did not translate into a win. Many observers put it down to poor timing. The 2016 Oscars were the subject of a social media campaign criticising the paucity of nominations received by people of colour (known as ‘Oscars So White’), and indeed neither Michael B. Jordan nor Ryan Coogler received nominations for their work on Creed. For the one nominee to be a white man arguably played poorly with race-conscious voters; a sentiment likely not helped when Stallone won the Golden Globe weeks earlier and forgot to thank Jordan or Coogler in his televised speech. Coogler and Covington’s screenplay puts Rocky in the perfect place. He is nearing 70 years old. His wife Adrian has been dead for some years. We soon learn that his best friend Paulie has passed away as well. His son has moved to Canada. He may still have his restaurant, but he has become a lonely old man. He is effectively waiting for his life to end. Meeting Donnie gives him something new to care about. It is a canny move in both character and narrative terms to re-position Rocky from being the fighter to being the trainer. He is now Mickey (the late, much missed Burgess Meredith) to Donnie’s Rocky. It fits him perfectly. It transforms Creed from being just another sequel to a superb re-invigoration instead. At the end of their conversation in Adrian’s, Donnie asks Rocky who won the third and private boxing fight between him and Apollo. Rocky replies that Apollo did. The moment is a wonderful small gift for long-term fans of Rocky. The fight they are discussing took place at the very end of Rocky III and ended on a freeze frame just as Rocky and Apollo started fighting. This is the first time the winner was ever confirmed. It takes time for Rocky to warm to the idea of training. He is already fending off approaches from the manager of Mickey’s Gym, Peter Sporino, to help train his son Leo. He initially gives Donnie a few training routines, then gradually gets drawn into training him one-on-one – much to Sporino’s displeasure. Gym manager Pete Sporino was played by English actor Ritchie Coster. Prior to Creed he was potentially best known for his appearances in American Gangster, The Dark Knight and the HBO drama Luck. Sporino’s son Leo, already a local rising star in boxing, was played by real-life boxer Gabriel Rosado. By the time of Creed’s release Rosado had won 20 matches as a light middleweight fighter, holding for a time the WBO Inter-Continental Light Middleweight championship. It is during this training period that Donnie meets and begins dating Bianca, who introduces him to Philadelphia and its own distinctive culture and way of life. Their first date sees them going out for cheese steak sandwiches. It’s a wonderfully written and performed scene, a little playful yet awkward, and performed in such a manner that both characters are treated with intelligence and respect. As a result it feels more emotionally honest and more romantic than many typical Hollywood romantic scenes. Ryan Coogler’s dedication to giving Bianca her own story and agency delivers tremendous dividends from the outset. With his skills improving and his profile rising, Donnie and Rocky set their first fight: a local bout against Leo Sporino. Minutes before the fight, a still resentful Pete Sporino learns of Donnie’s true parentage. Rocky begs him not to leak the information to the press, but after the match Sporino does – Donnie’s secret is out. Donnie’s fight with Leo is the one-take bout mentioned at the very beginning of this essay. Stunt coordinator Clayton Barber arranged the fight and rehearsed it at length with Jordan and Rosado. Cinematographer Maryse Alberti – a 25-year cinema veteran – supervised the photography, with Steadicam operator Ben Semanoff handling the camera itself. This complex, four-minute shot required a perfectly timed combination of acting, boxing, camera movement, and make-up. Oftentimes a long take (referred to in the industry as a ‘oner’) will comprise multiple shots ‘stitched together’ by editing and judicious use of digital effects. In Creed the four-minute shot was legitimately recorded in one single non-edited take. Ryan Coogler shot the scene 13 times on the third day of photography; it is the 10th take that appears in the movie. Coogler had originally intended to hire Rachel Morrison as his cinematographer, having already worked with her on Fruitvale Station. When Morrison was set to give birth during the Creed shoot, however, she declined the opportunity. Coogler approached Alberti based on her work on Darren Aronofsky’s 2008 film The Wrestler. Together they established the visual aesthetic for Creed, inspired largely by Jacques Audiard’s 2009 French drama A Prophet. 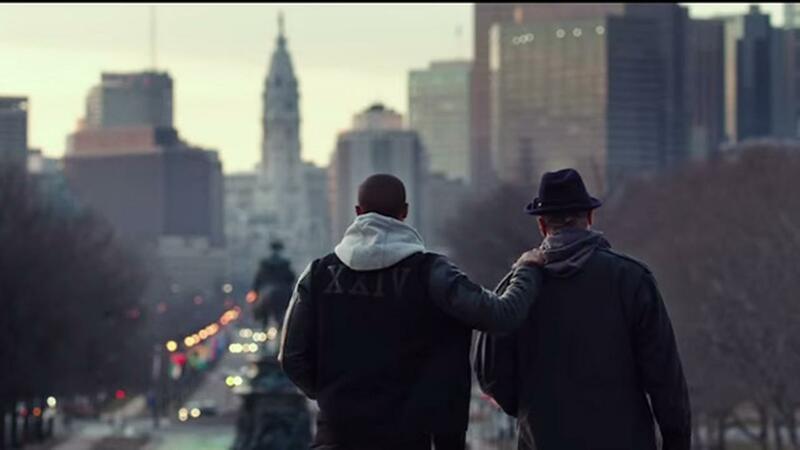 It would give Creed its own visual identity, leaving the familiar Philadelphia locations to remind the audience of Rocky. Immediately after the match, Donnie’s parentage is leaked to the press. Soon afterwards Rocky receives a call from Tommy Holliday, trainer and manager to world light heavyweight champion “Pretty” Ricky Conlan. He offers Donnie a chance at the title in a match to be staged in Liverpool, as long as he boxes under the Creed name. Tommy Holliday was played by Scottish actor Graham McTavish, who had previously worked with Stallone on the action sequel Rambo. To better train Donnie for the title bout, Rocky has him relocate from Mickey’s Gym to the more isolated Front Street Gym where they are less likely to be disturbed. He brings together a team to assist, including Jacob “Stitch” Duran – who played himself. One of the most highly regarded ‘cutmen’ in professional sports, Duran had previously appeared in Rocky Balboa as cutman to Mason “The Line” Dixon. During training, Rocky collapses. When in hospital, he is diagnosed with non-Hodgkin’s lymphoma. The scene of Rocky’s diagnosis is arguably Sylvester Stallone’s masterpiece. He crumbles from within but refuses to show. He visibly wants to cry but pretends that everything is okay. Viewers that have seen Rocky Balboa will know that his wife Adrian died of ovarian cancer, and it gives the moment a terrible and personal sense of pain. I generally find in the performing arts – film, television, theatre – that something vastly more upsetting to watch than a person crying is a person doing everything in their power to not cry. Tears bring an emotional release. The bottling up of those tears just becomes more painful with every passing moment. There have been countless scenes in film and television of people being diagnosed with cancer. I honestly believe Creed tops them all. A key aspect of Donnie is his bottled-up rage. He positively boils with anger at the way those back in Los Angeles refused to support him. He rages when he discovers Rocky – a surrogate father figure to him – is refusing treatment for cancer. Most of all he is so blindingly angry with his father, who died just before he was born: tantalisingly unknowable, and maddeningly out of reach. That rage boils over. Backstage at one of Bianca’s concerts he gets into a fist fight with a musician who takes a harmless dig in jest. To her credit – and to Coogler and Covington’s screenplay – a deeply hurt Bianca breaks off their relationship and is not quick to give Donnie a second chance. In classic three-act narrative style, Creed leaves Donnie and Rocky at their respective low points, and it is only together that they can rise again. Rise they do: Rocky is forced to undertake chemotherapy when Donnie offers him a deal: if Rocky fights the cancer, Donnie will fight Ricky Conlan. If Rocky is out, then Donnie pulls out too. It could easily be a trite sequence of events, but Coogler and Covington’s screenplay has developed the characters well enough that they more than earn it. Every Rocky film has had a training montage, in which weeks and even months of rigorous training get condensed into a few minutes and backed by an inspirational musical soundtrack. While it is uncertain if the original Rocky invented such montages, it is clear the film popularised them. The equivalent montage in Creed develops and evolves that montage format in two key ways. Firstly, the scene parallels Donnie’s training with Rocky’s chemotherapy. While Rocky may not throw a single punch during Creed, he does have to fight. It is a beautifully staged parallel montage to Donnie’s work-outs and runs. Secondly, Ludwig Göransson’s score cleverly remixes Bill Conti’s original “Gonna Fly Now” while developing it into a more appropriate theme for Donnie. It begins, as does Conti’s original, with a bell. The percussion then immediately develops into aggressively martial beats to showcase his still-contained rage and drive. Then it jumps back, however, slowing down to show the more emotional challenge facing Rocky. Back and forth it goes. It is a superb balancing act. At the climax, the original vocal style has been interspersed with a rap performed by Philadelphia musician Meek Mill. Donnie jumping up and down outside of the gym, surrounded by local kids circling on motorbikes, is a hugely uplifting moment. We do not hear what he is shouted up to Rocky, who watches from a first-floor window. We do not need to. After that moment, all that is left for Creed to do is let Donnie and Conlan fight. This, to me, is the real achievement of Creed. It is not simply an exceptionally well written and directed drama, it takes a well-known and widely loved franchise and remixes it as effectively as Göransson’s montage score. The original Rocky was a highly personal film for Stallone, that represented his own life and his own frustrations: people treating him as if he had no chance of succeeding, being mocked for his slurred voice – the result of a severed facial nerve during a forceps delivery at birth, and even the negative manner in which people treated Italian-Americans. Creed does broadly mimic the same story, but Coogler transforms it into just as powerful a representation of the African-American experience. He takes all of Stallone’s ingredients and applies them to his own personal experience, and in doing so transforms the Rocky saga into a profound expression of being black in 21st century America. While the respective entrances of Donnie – now boxing as Adonis “Hollywood” Creed – and Ricky Conlan were staged on location in Liverpool, the match itself was shot on a soundstage. This not only reduced the cost of hiring thousands of background extras, it also allowed for a more controlled environment to shoot the boxing. 73-year-old ring announcer Michael Buffer cameoed as himself, announcing the match in his world-famous style – including his personal catch phrase ‘Let’s get ready to rumble!’. Buffer had performed the same function in both Rocky V and Rocky Balboa, as well as the 2013 boxing comedy Grudge Match which co-starred Sylvester Stallone. While recording the scene, a close-up of Donnie getting punched in the face looked unconvincing. After trying and failing to get a convincing shot on several takes, Coogler turned to Stallone for advice. Stallone’s suggestion was to what had always been done in the original Rocky films: to make it look like Donnie had been savagely punched in the face, Michael B. Jordan would have to take the punch for real. Tony Bellew performed the punch and knocked Jordan out cold. The shot remains in the finished film. The film ends with Donnie helping Rocky – now in a slow recovery – up the famous 72 steps towards the Philadelphia Museum of Art. It feels like a handover: Rocky has shifted over now to becoming a trainer and father figure, while Donnie is now the boxer on the cusp of greatness. In all honesty, the Rocky saga could easily end there. Personally speaking, I am very happy that it doesn’t. Mike Fleming Jr, “How director Ryan Coogler’s own father-son saga fuelled Rocky revival Creed”, Deadline, 19 November 2015. Tara Brady, “Ryan Googler: ‘Apollo Creed meant everything to African-Americans”, The Irish Times, 17 January 2016. 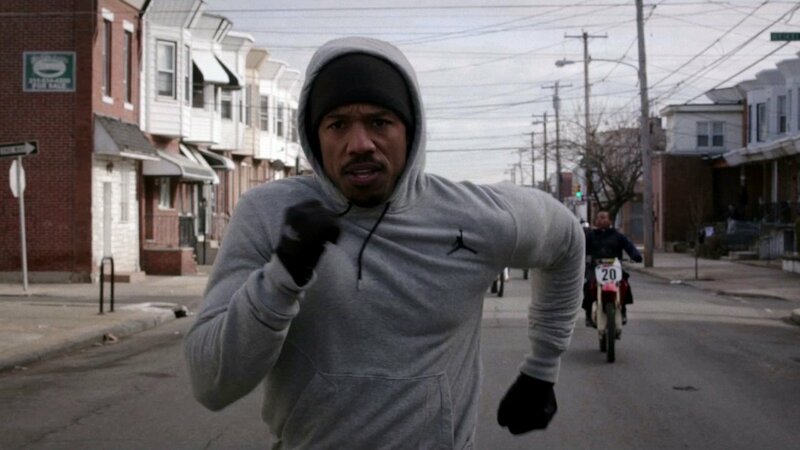 Mekado Murphy, “Ryan Coogler narrates a scene from Creed”, New York Times, 3 December 2015. Ramin Setoodeh, “Why Creed was Sylvester Stallone’s toughest role”, Variety, 5 January 2016. Cara Buckley, “How Sylvester Stallone faced his fears in Creed”, New York Times, 9 February 2016. Chris Heath, “How Michael B. Jordan won over an uncertain Sylvester Stallone”, GQ, 19 November 2015. Eric Eidelstein, “Creed isn’t just Michael B. Jordan’s movie – say hello to Tessa Thompson”, Complex, 28 November 2015. Kristopher Tapley, “Ryan Coogler on ‘Creed,’ Filmmaking as Journalism and the Need for Female Voices (Q&A)”, Variety, 5 January 2016. Kristopher Tapley, “Yes, That Dazzling Boxing Sequence in ‘Creed’ Really Was One Shot”, Variety, 1 December 2015. David Anderson, “Tony Bellew: Filming Rocky movie Creed was dream come true — now I want world title for real”, The Mirror, 14 January 2016. Matt Grobar, “Creed star Michael B. Jordan on Stallone’s advice and why Ryan Coogler is an ideal collaborator”, Deadline, 7 January 2016.